Sprint HTC Hero available today at Best Buy | Android Blast! If you're in the market for the HTC Hero and cannot wait until October 11 you are in luck. 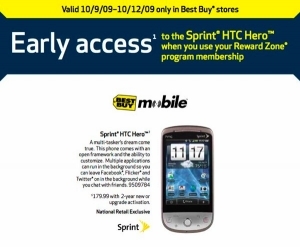 Best Buy stores are now offering Sprint's HTC Hero to Reward Zone members only. Reward Zone Members can pick up Sprint's first Android device a couple of days early. If you're like me you never signed up for the Reward Zone membership because you didn't want to receive mail from Best Buy you'll just have to wait a few more days.